Fabreeka-TIM® structural thermal break pad / connection, or thermal insulation material (TIM), is manufactured from a fiberglass-reinforced laminate composite. It is considered a green product for its energy savings with regard to energy loss caused by thermal bridging. In addition it is proven to have high compressive strength combined with resistance to thermal conductivity. Made from a fiberglass-reinforced composite, Fabreeka-TIM® has a per-inch R-value of 0.56 (BTU/Hr/ft2/in/°F = 1.8) and is far superior to steel (R-0.003) or concrete (R-0.08), providing a structural thermal break between flanged steel framing members. The primary benefit of Fabreeka-TIM® is that it maintains structural integrity while minimizing heat transfer. Fabreeka-TIM® material is supplied in sheets or cut to size per customer drawings and/or specifications and is available in thicknesses of 1/4” (6.4mm), 1/2” (12.7mm), 3/4” (19.1mm), 1” (25.4mm) and 2” (50.8mm). Precision water jet cutting is available for holes and special joints. Fabreeka-TIM® material is also supplied as thermal break washers for the bolted connections between external and internal steelwork. For optimal thermal break, the area around the fastener hardware should be taken into consideration. 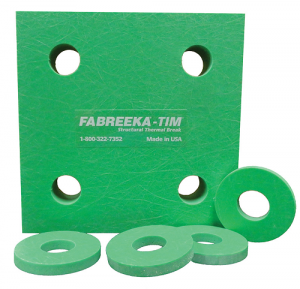 In addition to the Fabreeka-TIM® plate, Fabreeka recommends Fabreeka-TIM® thermal break washers and bushings made from Fabreeka® material. 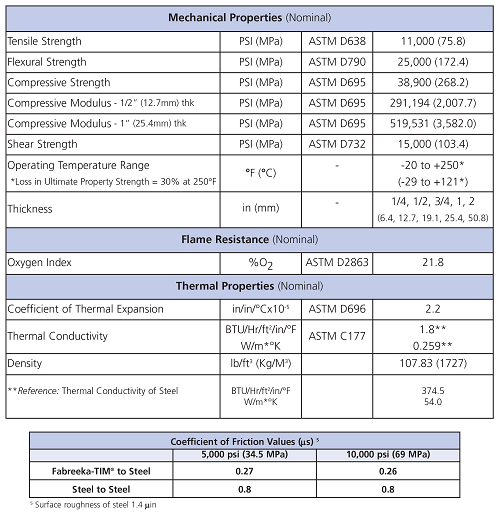 Why Choose Fabreeka-TIM® structural thermal break? Please see our Fabreeka-TIM® brochure and design guide for additional information on our thermal break product offerings. 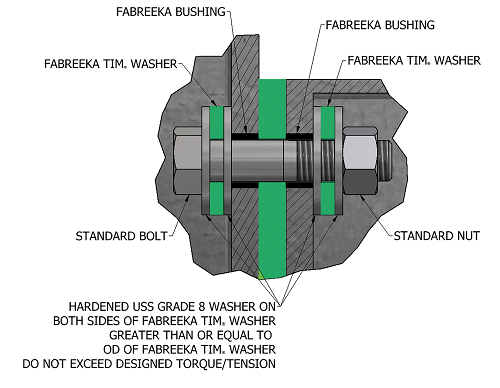 Fabreeka is pleased to provide the following specification in various formats for your use. 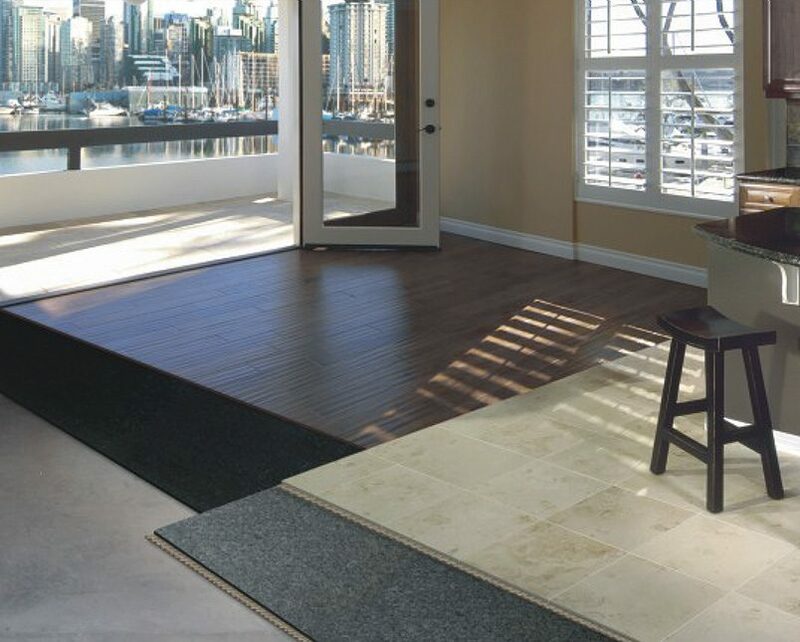 Fiberglass-Reinforced Laminate Composite, Fabreeka-TIM® , as manufactured by Fabreeka International, Inc.
Material shall maintain structural integrity of connections. Refer to Structural Drawings for specific Load requirements.